- Hand & Foot Pack. 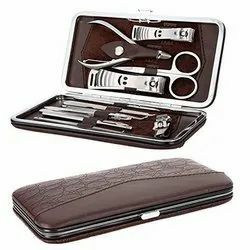 This Manicure Kit consists of 14 high quality instruments..
With our affluent industry experience, we are engaged in presenting an extensive Manicure Set. Premium quality 12 in 1 Stainless Steel Nail Clipper Manicure Set. It is important to keep baby`s nail trim and neat to prevent tearing and accidental scratching. Brand : Zwilling J A Henckels Frame case, neat´s leather, black, 5 pcs. We would like to introduce ourselves as a leading manufacturers and exporters of surgical and dental instruments, laboratory instruments and manicure & Pedicure Instruments. We have been supplying our high quality instruments to our dear European customers for over 17 years with their entire satisfaction in term of quality which perfectly meet the highest International standard. It includes a Nail paint + Body shower + 2 Rocher's + a Manicure kit. Our company has gained a wide recognition as a prestigious organization to offer our clients the premium quality range of Manicure Kit.